S-26 Progress Gold, Step 2. Premium follow-on formula - from 6 months. From 6 to 24 months your baby is becoming quite active and developing rapidly, and a well-balanced, nutritious diet is important. S-26 Progress Gold is rich in key nutrients, nutritionally superior to cowsÃ¢ÂÂ€ÂÂ™ milk and may help to look after your babyÃ¢ÂÂ€ÂÂ™s ongoing development. CowsÃ¢ÂÂ€ÂÂ™ milk is not recommended as a drink for babies under 12 months. Generations of babies have been nurtured on Wyeth formulas. 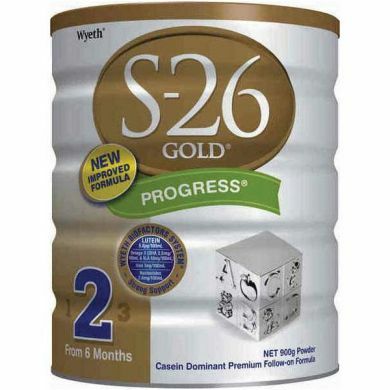 S-26 Progress Gold is enriched with additional important ingredients.